Ruby listens carefully while Zarah Sharma reads to her. 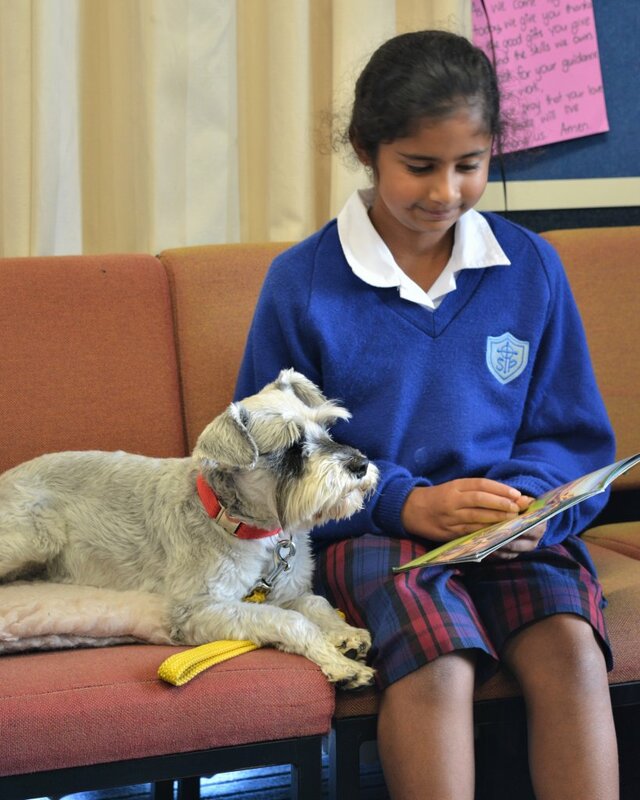 Reading has become one of the ‘cooler’ things to do at St Peter’s Catholic School since a delightful former student and Ruby the miniature schnauzer joined the reading programme run by literacy support teacher Heidi Osborn-Dunn. The former student is 24-year-old Tayla Missen, who has Down Syndrome. A St Peter’s school pupil from the age of five, Tayla returned last year to join the school’s adult-support reading programme and now comes in twice weekly to listen to the younger children read. Another star attraction in Heidi’s programme is Ruby, a mild-mannered rescue dog who is part of Danielle Schaad’s family. Once a week for the past year, Danielle has brought Ruby in for ‘Reading to Ruby’ remedial reading sessions. “She just sits quietly next to them as the children read; I’m there just to help with the words when needed. But because Ruby’s there and it’s done in a very non-judgemental way, the children are more relaxed about their reading,” said Danielle. Former pupil Tayla Missen listens to George Axon doing his reading. She said both Christchurch and Auckland city libraries offered Reading to Dogs programmes. The programme is further enhanced by voluntary hours provided by about eight adult support helpers, many of them contacted through the neighbouring St Peter’s Catholic Church.